A center line rumble strip is a longitudinal safety feature installed at or near the center line of a paved roadway. It is made of a series of milled or raised elements intended to alert inattentive drivers (through vibration and sound) that their vehicles have left the travel lane. In most cases, the center line pavement marking is placed over the rumble strip, which is sometimes referred to as a center line rumble stripe. Center line rumble strips can also be installed outside of center line pavement markings. A shoulder rumble strip is a longitudinal safety feature installed on a paved roadway shoulder near the outside edge of the travel lane. It is made of a series of milled or raised elements intended to alert inattentive drivers (through vibration and sound) that their vehicles have left the travel lane. An edge line rumble strip is a special type of shoulder rumble strip placed directly at the edge of the travel lane with the edge line pavement marking placed through the line of rumble strips. This placement is sometimes referred to as an edge line rumble stripe. Select a topic at right to view the questions and answers below. Why are rumble strips installed? Rumble strips are installed as a low-cost safety countermeasure that can reduce single-vehicle run-off-road (SVROR) and cross-center line crashes. Rumble strips, whether center line, edge line, or shoulder, alert inattentive or drowsy motorists whose vehicles have drifted out of their travel lane. As motor vehicle tires pass over the rumble strips, the drifting motorist receives auditory and tactile warnings to correct their path of steering. How effective are center line, edge line, and shoulder rumble strips at reducing crashes? Reductions were also shown on other types of roadways, but the estimates are not as statistically reliable. For drift-off-road crashes, studies of milled freeway shoulder rumble strips in Michigan and New York documented drift-off-road crash reductions of 38 and 79 percent. How does raised profile striping compare for performance and can it be used in lieu of rumble strips? Profiled pavement markings (e.g., raised thermoplastic, very thick epoxy or tape) are not meant to alert a distracted or drowsy driver like a rumble strip. They are meant to improve visibility under wet nighttime conditions. However, there are some raised rumble strip designs that insert a "cookie" within the striping. These have not been studied to the extent of milled rumble strips, but will clearly be less effective due to their limited dimensions. Is there any benefit to installing shoulder rumbles if there is no recovery area? In most cases there are still incremental benefits. Although several states do not install rumbles unless they have a minimum amount of additional shoulder or lateral clearance to fixed objects, these practices are generally in response to issues other than crash reductions (i.e., bicyclist use, noise impacts). Recovery areas include not just the paved shoulder but also any unpaved shoulder and recoverable slopes, including those that may be at the bottom of a non-recoverable but traversable slope. Reaction times vary and the recovery area along corridors also varies, so there is likely to be some benefit with edge line or shoulder rumbles even with limited recovery areas. What are the steps for adopting rumble strips at the agency level? A discussion regarding the feasibility, strategy, and costs of deploying rumble strips. Ensure upper management within the State DOT is fully aware of and supports the widespread application of rumble strips. Coordinate with the State DOT's bicycle and pedestrian experts to gain input into the types of roadways or conditions in which edge line and shoulder rumble strips may be applied as well as any specific concerns regarding design and placement. Most successful implementation efforts also get input from the bicycling community. Enlist Pavement Design and/or Maintenance experts in identifying the acceptable pavement surface conditions needed for rumble strip installation. Coordinate with Design and Traffic experts at Central and/or Regional offices to develop the details regarding the design and deployment strategies of rumble strips and design flexibilities. The input requested from these groups should not be an all-or-nothing acceptance, but criteria for decision making. What research and implementation guidance is available? Several resources are available that share the latest research, practices, and techniques used by transportation agencies. For information on rumble strips and their effectiveness, reference NCHRP Report 641: Guidance for the Design and Application of Shoulder and Centerline Rumble Strips. Do states apply center line rumble strips in passing zones any differently than in no passing zones? Many agencies continue center line rumble strips in passing zones and no passing zones (such as Missouri, Mississippi, and Texas), arguing that a typical drift-off head-on crash is as likely (or even more likely) to occur in a straight tangent passing zone than in a no passing zone. Some vary the rumble strip depth by making it slightly shallower. For example, Pennsylvania DOT varies the depth of rumble strips in passing zone from a typical depth of 1⁄2" to 3⁄8". Should tolerances be included in construction specifications for installing rumble strips? Yes, it is important to include tolerances in construction specifications to account for variations in how the equipment performs as well as the pavement conditions. If the specification is not stated properly, then the inspector has no basis for evaluating the installation to determine acceptance of the rumble strips. What tolerance should an agency include in their specification for the depth of a rumble strip? The tolerance should take into account the desired depth and the acceptable deviations from that depth. As an example, a specification such as, "a minimum 1⁄2-inch depth to a maximum of 5⁄8-inch depth" is more appropriate than specifying "1⁄2-inch deep cut with a 1⁄8-inch tolerance," because a 1⁄8-inch tolerance represents 25% of the milled depth, resulting in rumble strips that may not perform adequately. For centerline rumble strips, agencies need to specify the measuring point where the depth is to be full depth depending on the position of the milled section with the crown in the pavement. The depth at the edges (B) will be less than at the center (A). Agencies may also want to specify that the rumble strip be symmetrical to the crown. This is primarily an issue with older equipment where the milling head is on the side rather than in the center of the vehicle. How much does it cost to install rumble strips? Unit prices have been estimated to range between $0.10 and $1.20 per linear foot (about $500 to $6000 per mile). In general, contracts where rumble strip installation is the primary item are lower in unit cost than other contracts. What factors affect rumble strip unit costs? Mobilization, temporary traffic control, temporary pavement markings, and milled material disposal are sometimes the driving cost factors for rumble strip installation. Costs for rumbles installed as a stand-alone project may vary significantly compared to installation as part of a larger reconstruction, resurfacing, restriping, or crack sealing project based on a number of factors, including traffic control, scheduling of work, mobilization, type of work to be performed, etc. Longer projects or those with higher rumble strip quantities typically have a lower unit price. Milling into concrete is significantly more expensive than asphalt because there is two to three times the wear on the milling head. If road sections receiving rumble strips are located close together, costs may be minimized; whereas, road sections that are far apart may have higher costs attributed to travel time to the sites. The contract may require that milled materials be swept, collected, and hauled from the site, thus increasing rumble strip costs. It is often difficult to compare unit prices for these very different methods as some may include only the cost for milling the rumbles, while others include the cost of lane closures or other incidentals. What is the cost to remove a rumble strip, should it be necessary? Since specific circumstances dictate the method and costs, it is difficult to provide a price range. For example, in Arkansas, when a portion of the center line rumble strips had to be filled in due to noise concerns, crews hand placed a patching type material in the rumbles (somewhat similar to pothole repairs). The materials were inexpensive, but it was a labor-intensive process that would probably only be cost-effective for removing small sections of rumbles. In another example, Michigan milled out 10 miles of rumbles on both shoulders and inlaid fresh asphalt. The cost was $13,000 per shoulder-mile. Why are milled rumble strips preferred over rolled? When rumble strips were in the early implementation phase, many construction methods were tried and evaluated for cost, productivity, effectiveness, and quality. Rolled-in rumbles, rumble strips constructed as part of the conventional paving process (modifications to the compaction roller), were tried and found lacking in all factors listed above. Milled rumble strips have become the standard construction practice due to their flexibility to construct various rumble strip shapes and spacing within acceptable tolerances and cost effective operations. The equipment used for milling rumble strips continues to evolve. What is the typical pavement thickness for rumble strip placement? Washington DOT requires at least 3" of paved surface, in fair or better condition, in order to apply a rumble strip with 1⁄2" depth. Pennsylvania DOT requires an overlay thickness of 2.5" or greater to install rumble strips. Missouri DOT does not typically install rumble strips where pavement lifts are less than 1 1⁄2" thick. Are milled rumble strips used on bridge decks? Rumble strips are not normally applied to bridge decks due to the presence of rebar. What considerations can be made when installing rumble strips on chip seal surfaced roads? Several agencies have experienced delamination of the chip seal (pavement surface treatment constructed by spraying liquid asphalt on the pavement surface followed by an application of small size aggregate) near the area of the rumble strip when milling rumble strips into chip seal surfaces. Many agencies either mill the rumble strip before applying the chip seal or place the chip seal over an existing rumble strip. Michigan DOT has found that milling rumble strips to 5/8" depth prior to applying the chip seal provides good quality rumble strip and often a second chip seal over these rumble strips has adequate alerting noise and vibration without the need for the rumble strips to be re-milled. In Idaho, standard practice is to install rumble strips before applying a chip seal. While they have installed rumble strips after applying the chip seal, they found that the milling process causes chips to unravel. In Washington, standard practice is to install rumble strips before applying a chip seal due to experiences with delamination when the chip seal is placed prior to milling in the rumbles. However, Montana DOT regularly chip seals and then mills rumble strips. Where the depth of the existing rumble strip is 5â�„8" (or greater), Montana DOT can perform the chip seal and not have to re-mill the rumble strips. Where existing rumble strip depth is 3â�„8" (or less), the DOT re-mills the rumble strips. What is the impact of constructing chip seal on a rumble strip? Chip seal on top of an existing rumble strip has been shown to retain the basic shape of the rumble, although losing some cross-section. However, stones from the chip seal enhance the noise and vibratory properties of the rumble. What considerations can be made when installing rumble strips on micro-surfaced roads? Recent experience in Michigan has found that preventative maintenance treatments such as ultra-thin hot mix asphalt and micro-surface can be compatible with rumble strips. Micro-surface and ultra-thin hot-mix asphalt overlays fill in existing lines of rumble strips, but a fresh line of rumble strips can be cut into the overlay at the same location without significant delaminating caused by the underlying filled-in rumbles. All pavements (hot mix asphalt (HMA), ultra-thin HMA, chip seal, micro-surfacing, etc.) need to have a minimum thickness of "bound" pavement material before rumble strips are installed. "Bound" pavement materials are a combination of all layers of the materials listed above but does not include cold in place (CIP) recycling. What is the impact of micro-surfacing over a rumble strip? Micro-surfacing fills in existing lines of rumble strips, but a fresh line of rumble strips can be cut into the overlay at the same location without significant delaminating caused by the underlying filled-in rumbles. Michigan DOT requires that pavement be cleaned and existing rumble strips filled prior to applying the top course of micro-surface, either by a leveling course or a separate pass. What impact do center line rumble strips have on center line joints? Some agencies have expressed concerns that center line rumble strips installed across longitudinal joints would contribute to early joint or pavement deterioration. For the most part, these concerns have been shown to be unfounded. When installing rumble strips on existing pavement, the pavement should be rated as fair or better to be able to accept the milling process without raveling or deteriorating the pavement. For example, Missouri DOT has not experienced issues milling through the joint as long as the pavement is in good condition. Michigan DOT applies center line rumble strips across the joint line. In other cases State DOTs have shifted the joint to be off-center so the center line rumble strip and centerline marking can be placed at the center of the roadway but not on the joint. What experience do agencies have with pavement deterioration or other maintenance issues due to rumble strips, such as water retention or freeze-thaw damage? In 2001, Colorado DOT performed an evaluation of center line rumble strips. After a period of five years, it was determined that the rumble strips did not have any significant detrimental effect on pavement life. In another example, Wayne State University studied rumble strips in Michigan and found that rumble strips were not connected to short-term pavement deterioration. How do you re-install rumbles after paving operations, especially thin asphalt overlays? Some agencies re-install the rumbles immediately, as part of the resurfacing project. Others choose to re-install during area-wide rumble strip installation projects, which are scheduled at intervals (such as annually), and replace rumbles on all recently paved projects. Surface preparation when paving over existing rumble strips also varies. Some agencies have found that simply overlaying the rumble strip works adequately, while others mill out the rumbles and either inlay or overlay. Many agencies mill the pavement before placing the new asphalt overlay – the rumble strip is removed by this standard milling process, thus the situation of treating existing rumbles is not experienced in many new asphalt overlays. Recent experience in Michigan has found that shoulder preventative maintenance treatments such as chip seal, ultra-thin hot mix asphalt, and micro-surface, can be compatible with rumble strips, but the preferred techniques vary slightly. Chip seal on top of an existing rumble strip has been shown to retain the basic shape of the rumble, although losing some cross-section. However, stones from the chip seal enhance the noise and vibratory properties of the rumble. Micro-surface and ultra-thin hot-mix asphalt overlays fill in existing lines of rumble strips, but a fresh line of rumble strips can be cut into the overlay at the same location without significant delaminating caused by the underlying filled-in rumbles. It is not advisable to mill in rumbles after chip sealing as delamination of the chip seal in the area surrounding the rumble has been experienced in many instances. What is the difference between the rumble strip-related noise inside the vehicle and outside nuisance noise? Rumble strips, whether center line, edge line, or shoulder, alert inattentive or drowsy motorists whose vehicles have drifted out of their travel lane. As motor vehicle tires pass over the rumble strips, the drifting motorist receives auditory and tactile warnings to correct their path of steering. Rumble strips produce two distinct noises as vehicles pass over them: one inside the vehicle to alert the driver they are leaving their lane and one that can be heard outside the vehicle. The outside noise is sometimes considered a nuisance to those who live nearby, especially because it is different than other "normalized" sounds in those areas (e.g., highway traffic, train traffic or whistles, air traffic). Depending on several variables, such as the distance and presence of physical objects between the rumble strip and where noise is heard, wind speed and direction, type of vehicle crossing the rumble strip, and others, outside noise can vary greatly with each pass over a rumble strip. How is rumble strip nuisance noise measured? What is the recommended practice with respect to rumble strip application where noise may be a concern? Place shoulder rumble strips farther from the roadway or replace edge line rumble stripes with shoulder rumble strips, to reduce the frequency of contact with the rumble strip/stripe. Widen pavement through horizontal curves or design curves with a "spiral transition" to reduce the likelihood of vehicles crossing the center line or edge line. Restripe the curve to increase the travel lane width (and reduce shoulder width through the curves). Restripe to decrease the lane width to create a narrow painted median through the curve. Reduce the rumble strip depth. Install sinusoidal-shaped rumble strips or raised thermoplastic markings. Consider excluding rumble strips near residential areas. Discontinue rumble strips in the vicinity of intersections and major driveways. Are sinusoidal rumble strips quieter than milled rumble strips? Is there a minimum shoulder width that allows for rumble strips and bicycle accommodations? There is not one set width that will accommodate bicyclists. Bicycles are legal road users who may travel in the lane. Per the AASHTO Bicycle Design Guide, a minimum 4' of useable width (not including rumble strip width) is needed to accommodate bicyclists. An additional 1' of width is needed if the shoulder is adjacent to a barrier. Additional width is desirable where motor vehicle speeds exceed 50 mph; where high volumes of trucks, buses, or RVs are expected; or if static obstructions exist at the right side of the roadway. In some cases, to address a particular safety issue, agencies may choose to install rumble strips on existing roadways even when sufficient shoulder for bicyclists cannot be provided. Such decisions should be made with full recognition of the impact on all roadway users. Are there rumble designs that accommodate bicycle traffic? Use of "bicycle" gaps in the shoulder or edge line rumble strip permit riders to freely move between the lane and the shoulder should it become necessary. At locations where an agency's standard rumble strip design practice does not meet the needed width of shoulder space beyond the rumble strip, rumble strip designs can be modified to accommodate bicyclists. Changing the offset (e.g. use of edge line rumbles instead of shoulder rumbles) and/or narrowing the rumble strips may allow for additional shoulder width to be utilized by bicyclists. Narrower rumble strips ranging from 4-8" in width have been used in situations where a typical rumble strip (often 12-18" wide) is not feasible. Where plowing is not a factor, some raised designs may be effective, although they are typically higher cost and require frequent maintenance. What impact do center line rumble strips have on bicyclists and motorcyclists? While there may be a perception that motorists shy away from center line rumbles, moving traffic closer to bicyclists traveling on the shoulder, research conducted by Michigan DOT and Texas Transportation Institute did not support this claim. For motorcycles there are at several studies that say there is no impact. What are appropriate lane widths for considering rumble strips on two-lane roadways? No research has been conducted to date with respect to this topic. Typically, rumble strip placement with respect to lane width is determined using engineering judgment. Pennsylvania DOT recommends that at least 10' of travel lane exist before installing center line rumble strips. To install a combination of center line and edge line rumble strips wider lanes will likely be required. Washington State DOT recommends having a combination of paved lane and shoulder width of at least 12' before installation. Michigan DOT recommends that the travel lane plus paved shoulder width beyond the center line corrugation is greater than 13' in width. Should there be gaps or breaks in rumble strips? Most rumble strip applications provide gaps and/or breaks in rumble strips. Continuous shoulder and edge line rumbles often have intermittent bicycle gaps (e.g., every 60') and are broken at intersections, interchanges, and sometimes across bridges. At interchanges, the rumbles frequently split and follow the right and left edges of the ramp. Similarly, for intersection turn lanes, the location of the rumble will continue at the same offset of the turn lane edge line, as they were on main line. For intersections without turn lanes, the breaks in the rumbles may include approaches if vehicles are likely to cross the edge line before reaching the intersection. Gaps in center line rumble strips are typically provided only at intersections. 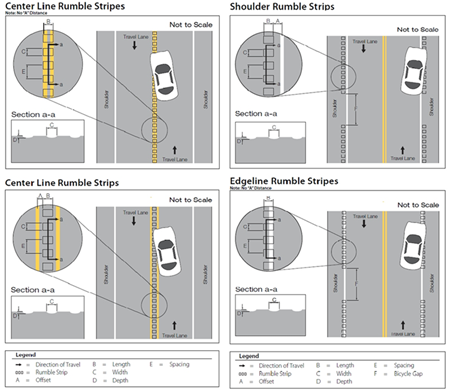 Some jurisdictions have chosen to discontinue center line rumbles in passing zones; however, studies indicate that most head-on crashes result from a motorist making an unintentional maneuver, which is just as likely to occur in a passing zone as a no-passing zone. While there may be location specific reasons to discontinue the rumble strips, a policy of not installing in passing zones is, for the most part, unnecessary as research has shown that center line rumbles do not impede passing opportunities, even for motorcycles. For both types of rumbles, agencies may consider discontinuing them across bridges where the depth of the rumble may diminish cover of steel reinforcement. What are the appropriate dimensions for a rumble strip? Appropriate measurements depend on the need and the facility. The most common dimensions (and those on which the crash reductions are based) are 7" X 16" X ½" with 12" center-to-center spacing. Several states vary one or more of these dimensions as their standard or for specific facility types. Another common design for center line rumbles is 7" X 12" X ½". Adjusting the dimensions is particularly common on shoulder or edge line rumbles, due to narrow pavement widths or to provide additional shoulder width beyond the rumbles to accommodate bicyclists. Many agencies have experimented with narrow rumble strips on narrow pavements. At this time, 8" wide rumble strips are not uncommon on certain road types with narrow pavements. Some Agencies are even experimenting with 6" and 4" wide rumble strips. Keep in mind that the effectiveness of the rumbles' warning properties will be decreased by reducing the dimensions, but the extent of this is currently unknown. How does weather impact rumble strip/stripe effectiveness? During wet and/or nighttime conditions, rumble strips improve driver recognition of center line or edge line stripes by extending and enhancing visibility of the line (compared to a typical pavement marking). Even in snowy conditions, the rumble pattern is sometimes audible (and sometimes visible in light snow) and can improve driver recognition of the limits of their travel lane. How do rumble strips affect snow plow operations? While raised rumble strips are incompatible with plowing operations, snow plow operators have indicated a positive effect associated with milled rumble strips. Operators have indicated that milled rumble strip patterns enhance their ability to discern the limits of their travel lane. In cold weather, will water pond and freeze in the rumbles? When installed in pavement with a fair or better rating, rumble strips are not affected by freeze/thaw cycles any more than the surrounding pavement. Are there construction guidelines or checklists available to assist during inspection? Consult your state's standard drawings and specifications for rumble strip dimensions, approved designs, and acceptable materials and practices. 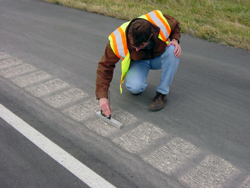 Using a rumble strip measurement device (shown below), inspectors can measure rumble strip dimensions as rumble strips are installed to ensure that the Agency's specifications are being implemented. How does one remove rumble strips, should it become necessary? 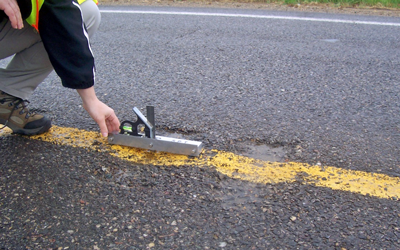 While filling rumble strips is not an ideal situation, there are occasions when rumbles are removed or relocated due to a number of unique issues at a particular location. In these cases, Agencies have used epoxy fillers as a short-term solution until the next scheduled pavement overlay. There may be instances where it is necessary to mill rumble strips from existing pavement before applying a new pavement surface (e.g., thin lift pavement treatments used in conjunction with lane change configuration where the wheel path is near the current rumble location).